The area of Ekaterina’s interests at the Faculty of Geology is theoretical study of mineral phases of the Earth’s mantle by using of atomistic and quantum-chemical approaches, as well as evolutionary prediction of crystalline structures at high pressures. Additionally, Ekaterina develop models of interatomic potentials for modeling of solid solutions of minerals, in particular monazites and xenotim, containing rare earth elements as potential matrices for the disposal of high-level radioactive waste. Ekaterina took part in the first scientific school organized by SCTMS in Samara and she is glad to come here again with the aim of improving skills in the ToposPro software. 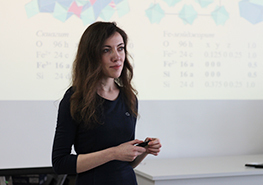 On February 6, Ekaterina I. Marchenko gave a report "Atomistic and quantum-chemical modeling of crystal structures and physical properties of mantle phases of variable composition" at the SCTMS conference hall. In this report the results of the PhD thesis as well as possible prospects for cooperation between the Department of Crystallography and Crystal Chemistry at the Faculty of Geology of MSU and Samara University were presented.